On Sunday, April 22nd, the Albert Church Brown Memorial Library hosted Dr. Louisa Barnhart who spoke to a full room of participants and showed pictures and videos of her 3 month trip to Southeast Asia with her husband, Michael Klein. Their travels included Bhutan, Laos, Cambodia, Thailand, and Vietnam. Dr. Barnhart described the visit to Bhutan in detail with pictures and videos. There were dances with elaborate costumes and masks that illustrated the mythology of their culture. 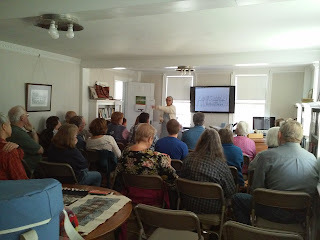 Then she described numerous adventures in other cultures, including changes she experienced from travel 35 years ago. 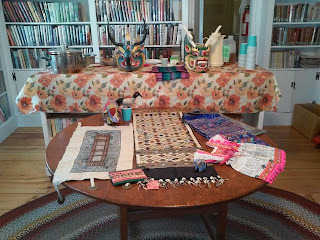 A display of the textiles, masks used in celebrations, and samples of various foods and drinks representing the area. Participants were able to taste the foods and drinks and get acquainted with some items that Dr. Barnhart brought back from Southeast Asia.